When an 18-year-old Kurtis Patterson hammered 157 in his debut first-class innings, it seemed like he was on the fast track to Test selection. Now, seven years later, Patterson finally looks set to earn a baggy green. It seems unlikely the selectors added Patterson into the squad at the last minute – a rare move on their behalf – only to leave him on the bench for the first Test against Sri Lanka in Brisbane. Australia’s best-possible top six would read: Marcus Harris, Joe Burns, Usman Khawaja, Kurtis Patterson, Travis Head and Will Pucovski. Yet the selectors aren’t likely to drop incumbent number three Marnus Labuschagne for a second time just three matches into his Test career. They also may be seduced by the extra bowling option he offers, which makes me think Labsuchagne will play instead of Pucovski. Regardless, there has never been a better time for Patterson to finally step into international cricket. The 192cm-tall left-hander has not only strung together 2848 runs at 45 in first-class cricket since the start of the 2015-16 summer, but is also coming off a double of 157* and 102* against Sri Lanka in their sole warm-up match. So dominant was the 25-year-old in that fixture that he scored at 4.5 runs per over, on a pitch where Sri Lanka could go at only 2.4 runs for the match. Both of his knocks were expertly paced as he first came to grips with the conditions and his opponents, playing within himself, before expanding his game once well set. This is old-school cricket and Patterson is an old-school cricketer. He is not a dynamic batsman who leaves onlookers in awe at his God-given talent. He is not a white-ball cricketer trying to convert his skills to the longest format. He is not a batsman who can turn a match on its head in a session. Instead, he is in the mould of Simon Katich or Chris Rogers – substance over style. Neither Katich nor Rogers drew fans to the TV or through the turnstiles like their teammates Adam Gilchrist or Michael Clarke. They were ugly but effective. They put a hefty price on their wicket. They played to their strengths. This is Patterson to a tee. It takes a while to warm to his deep-in-the-crease, minimal-footwork style. Indeed, this approach will be rigorously tested by canny bowlers, who will feel they can pin him back on his stumps in the way in which Peter Handscomb has been exposed. Except that Patterson’s style is not so exaggerated. He doesn’t bat from quite as close to his stumps as Handscomb and, most importantly, gets a longer stride towards the ball when he comes forward. That front foot, however, does not tend to land too far outside off stump, even when a delivery is well wide, which leaves Patterson often playing away from his body. He has got away with this at first-class level in part because he is so well balanced at the point of impact, with his head perfectly level and still. In this one way, his technique reminds me of Steve Smith. Patterson is strongest off the back foot, possessed of a fine pull-shot and particularly adept at the cut. His relative lack of footwork does seem to tempt quicks into offering him wide tempters which Patterson routinely clatters. 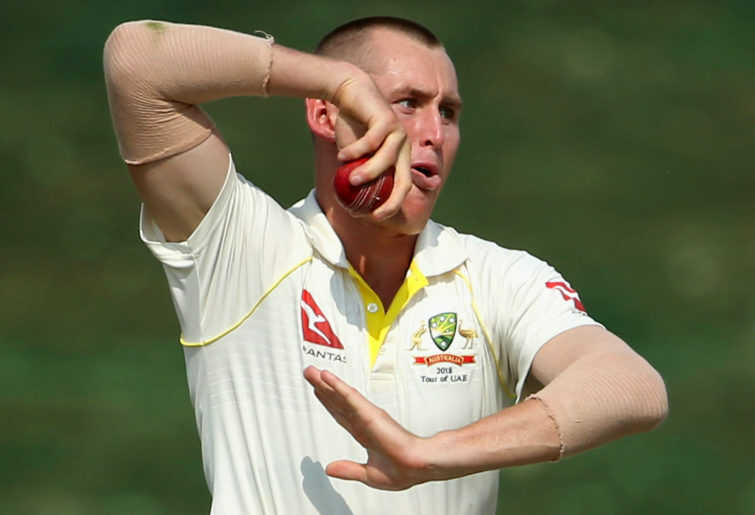 Putting his technique to one side, the main difference between Patterson and most of Australia’s recently-elevated Test batsmen is that he has been picked due to consistency, rather than a purple patch. Across his last four Sheffield Shield seasons Patterson has averaged 48, 37, 45 and 53. He has also shown the ability to step up when playing red-ball matches for Australia A or the Cricket Australia XI, with 630 runs at 63 from seven matches. Patterson looks to be at the perfect stage of his career to make his Test debut. He has perhaps a decade left in his career, yet also has plenty of experience, with 58 first-class matches to his name. Patterson is also intimately familiar with the up-and-down nature of professional cricket, having started his career in the most commanding fashion possible, only to then struggle badly in his following two Shield seasons. He emerged from that prolonged slump as a wiser and more-rounded batsman and has since put together four seasons of consistently-good first-class performances. Patterson has well and truly earned a baggy green.